Shrimp and andouille sausage in a tasty bell pepper sauce served over creamy white cheddar grits. 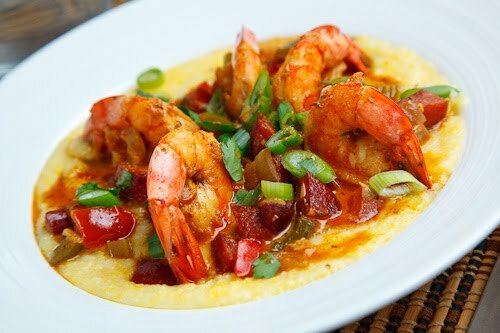 Shrimp and grits is another classic southern dish consisting of shrimp that is cooked in a sauce and served over grits, or cornmeal. I have been meaning to share this recipe for shrimp and andouille grits for a while now and with Mardi Gras coming up it was the perfect time to do so. Don’t let the long list of ingredients fool you as this recipe is actually really easy to make and it only takes about a half an hour to throw together. This is one of those recipes that I like to play around with a lot, changing things up but this version with the andouille sausage has to be my favourite. The sauce that the shrimp and andouille sausage are served in starts out with a base of onions, celery and pepper and it is seasoned with garlic, thyme and cajun seasoning before being smoothed out by some cream. Serving the shrimp and andouille over simple buttered grits is always nice but I like to add some cheese to the grits and a sharp white cheddar is particularly nice. Bring the water to a boil, stir in the grits, reduce the heat and simmer until tender. Add the sausage and sear, about 3 minutes and set aside. Toss the shrimp in the cajun seasoning, add the shrimp to the pan and cook, about 2-3 minutes and set aside. Heat the oil in the pan, add the onions, peppers and celery and cook until tender, about 5-7 minutes. Add the garlic, thyme and cajun seasoning and cook until fragrant, about a minute. Add the broth and tomato and simmer to reduce a bit, about 5 minutes. Add the sausage and shrimp, season with salt and pepper, mix in the cream, green onions and parsley and remove from heat. Mic the butter and cheddar into the grits and remove from heat. Serve the shrimp over the grits. This looks fantastic Kevin. I love shrimp and grits. It looks like you are getting into the spirit Kevin! One of my favorite dishes and about the best photo I have ever seen of it. As a French person I have never been really attracted by cornmeal but you're making me change my mind. I was wondering what to do with my frozen shrimps and now I know! You always share great recipes!!!! Thanks so much! What a delicious and flavorful Cajun dish, Kevin! This looks right up my alley. Thanks for sharing! Wow, this sounds delicious and easy too! I've never had grits or cornmeal before; does it taste exactly like fresh corn? I like shrimps so i will definitely like this recipe!!! I made this today, I couldn't wait. Of course it was awesome! Wow…this looks absolutely amazing. 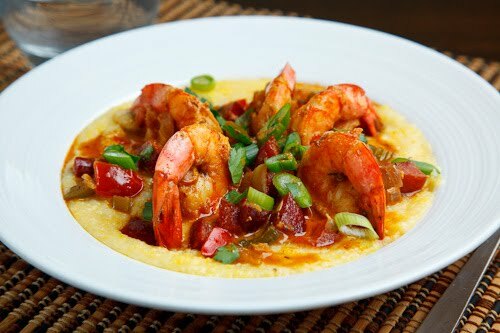 Shrimp and grits is on my foodie bucket list! it seems so good.. 🙂 I discovered u by chance and I adore shrimps.. thanks for this recipe! I'l try it for sure..
Looks great! I gotta try this recipe since I am heading to New Orleans in a few months! This is delicious. I made it tonight for my husband and his parents. 4 clean plates at the end of the meal. I will definitely make this again. Thank you! I'm going to have to try this. I keep hearing that shrimp tastes good with grits, I do like my grits a bit sweet but def going to give this a go! Thanks so much for sharing!!! Made this last night for me and the boyfriend. Absolutely loved it and he liked it so much he had seconds! Tried this tonight, great recipe! The cheddar got mixed in with the topping instead of the grits, but it was still superb! My partner and I really appreciate your recipes–this is our third time trying one & we plan to keep on going, great job! Liz: Can you give me some more information on what was wrong? I've just bookmarked this. I'm going to make me some shrimp and grits this weekend. I can't wait! I made this for my roommates tonight, and it was a hit. They all loved it! We recently had a similar dish at a fancy restaurant in Charleston. This dish tasted just as great as that dish. Thank you for posting this recipe. Anonymous: Yes I peel them first but I do leave the tails on a few of them when I photograph dishes like this as it gives a better presentation for the photo. This is fantastic! Made it tonight and it was a hit. I did use some cornstarch and some of the sauce to thicken the sauce a little (a good southern roux would be good, too, but I was in a hurry and cornstarch is quick) and added salt to the grits. Two thumbs up from me!